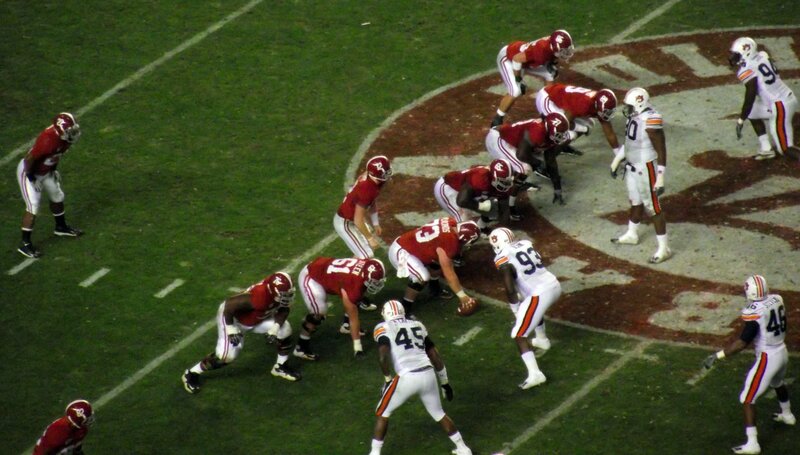 Last year Alabama entered the season with a very unsettled situation at quarterback. The Tide returned two veterans in Cooper Bateman and David Cornwell but they took a backseat entering game one against USC to highly touted redshirt freshman Blake Barnett and Jalen Hurts who wowed many fans during his first spring game at Alabama. Blake Barnett looked nervous as the starter against USC and Jalen Hurts was quickly inserted and made a huge impact on the offense after a fumble on his first possession. Jalen rebounded quickly and led the Tide to a 52-6 demolition of USC and solidified himself as the starting quarterback for the rest of the season. This year Nick Saban is presented with another challenge at the quarterback position, developing depth. Behind Jalen Hurts there is zero experience. True freshman early enrollee five star quarterback Tua Tagovailoa will battle another true freshman enrollee, three star Mac Jones. Also in the mix is walk on sophomore Montana Murphy. Entering this season Jalen Hurts will enter the fall as the leading candidate to start under center for the Crimson Tide. Jalen has worked hard during the off season and showed improvement in his downfield passes. Last season Jalen completed 240 of 382 passes for 2780 yards, 23 touchdowns and 9 interceptions. Those are very impressive numbers for a true freshman, especially at Alabama when you have to go back to 1984 to find the last time a true freshman started under center in Tuscaloosa. Vince Sutton started five games in 1984 as Alabama struggled with their first losing season in over 25 years as the Tide finished with a 5-6 record. Hurts basically rewrote the freshman record book at the University of Alabama last year and led Alabama to the national championship game. But Jalen did show he was human and was still a true freshman last year down the stretch. LSU basically wrote the blue print on how to defend Jalen Hurts in Lane Kiffin's offense. After that game Jalen struggled at times against the better defenses of Florida, Washington and Clemson completing less than 50% of his passes. The inability to throw the ball downfield with much consistency resulted in Alabama's offense to sputter at times late in the season starting with the LSU game. Last year Jalen often broke games open with his legs. Hurts ran 191 times for 954 yards and 13 touchdowns. With Lane Kiffin gone as offensive coordinator and Brian Daboll taking over the offense, look for Jalen to run much less this year. Especially with zero experience at quarterback behind him. Brian has been brought in to help Alabama get back to more of a balanced pro style attack that brought Alabama much success in the past and is working hard to help develop Jalen as a more successful downfield passer. Going into fall practice, Jalen is by far the front runner to run the Bama offense this year. Many people feel that five star freshman quarterback Tua Tagovailoa can push Jalen for the starting job this year. But Coach Saban is quick to try to temper those expectations on the freshman quarterback. Tua threw for over 300 yards in the spring game which opened the eyes of many Tide fans and reporters. But Saban is quick to point out that those yards came against the second team defense and struggled in his short opportunity against the first team offense completing one of three passes. There is a lot of hype behind Tua because of comments made by people such as former NFL quarterback Trent Dilfer who said earlier this year that Tua is throwing the ball better now than Aaron Rodgers threw the ball in his sophomore year at California. That comment raised a lot of eyebrows and put a lot more expectations on Tua this year. Look for Tua to get some playing time early in the season. We may not see him in the Florida State game if it is close and Jalen is managing the game well under center. But we will likely see Tua get a lot of playing time in week two against Fresno State. It is important to get his feet wet and get him some playing experience as early as possible in case Jalen gets injured or struggles. Tua has the talent to be a great quarterback at Alabama, but right now will enter the season most likely as the backup to Jalen Hurts. True freshman and early enrollee Mac Jones will also likely see playing time at some point early in the season to get him some important playing experience and help to develop needed depth under center. Much like Jalen and Tua, Mac is also a high character kid with good leadership ability. Nick Saban knows how important it is to have strong team leadership from the quarterback and that is one area this group of quarterbacks seem to excel. Mac is rated a three star quarterback by 247 Sports composite ratings. Mac is a very accurate passer with good foot work. He is not the dual threat that Jalen and Tua poses, but is athletic enough to step up in the pocket to buy time to throw the ball downfield or scramble to pick up a few yards. At this point Mac needs to add some weight and some arm strength but might be the most accurate passer among all of the quarterbacks on Bama's current roster. Mac will likely enter the season as the number three quarterback on the depth chart. Walk on quarterback Montana Murphy will likely serve as the fourth string quarterback this year. He is listed as a sophomore at 6'3 and 205 pounds. He comes from Carroll High School in Southlake, Texas, the same high school that produced Greg McElroy who led Alabama to a national title in 2009. Not much information on Montana Murphy is listed. Unless the injury bug hits the Crimson Tide not sure if Montana will see playing time this year.